Like you, we here at KnifeInformer.com are truly passionate about our knives. We are fortunate to have some really excellent knife manufacturers out there today who bless us with blades of the finest quality to meet our ever growing standards. There’s nothing better than taking ownership of that pristine pocket knife that you’ve been saving up for months to buy. The clinically forged blade, the razor sharpness and the acute attention to detail in the handle and deployment mechanism are all things we drool over in our newly acquired high end pocket knife. But wait…we’re all human and it’s human nature to seek out that once in a lifetime bargain to try and get the most out of our dollar. Maybe you find the knife you’re looking for on eBay for almost half the price. What a score, right?! Sure…unless you have fallen prey to the sinister world of counterfeiting. Yes, it’s true. Unfortunately the number of counterfeit (i.e. fake) knives on the market is increasing. These products are produced very cheaply with substandard manufacturing processes and just nowhere near the quality you’ll find on the official product. What may appear to be the deal of the century will likely turn out to be a cheap, shoddy fake that looks just like the real thing on the surface but deep down lies a piece of crap. Worse still is the increased danger that accompanies fake knives, particularly with respect to ineffective locking mechanisms that could result in serious injury to you or anybody that uses your bargain priced knife. Still sound worth it? Absolutely not. The fact of the matter is that as with all high end products this seedy grey market exists to prey on unsuspecting customers like yourselves. With the top pocket knives now reaching upwards of $200, $300 and even $400 these days the counterfeiters see a prime opportunity to make knock-off’s which cost around $20 to produce and sell for around 60-80% of the legitimate versions. Just enough discount to lure you in. Many of these knives will carry fake branding and logos which can look very similar to the official product. Make no mistake it’s an illegal business. The major manufacturers we know and love are doing what they can to combat these sorts of activities but the counterfeiters will always be one step ahead. The only true way to eliminate it is simple – only buy official products from licensed dealers. 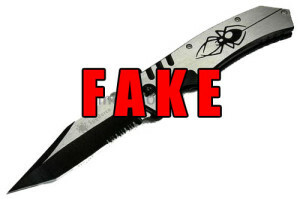 Many of the fake knives are sold online from auction websites or sketchy looking e-commerce sites but you will also find them at garage sales, swap meets and vendors on the street. Nobody wants to be ripped of by receiving a counterfeit pocket knife. Most of what you need is simple common sense and you should be fine. Check out our tips below for staying clear of the fakes. Again, it’s common sense here but as the saying goes, if it looks like a duck, swims like a duck, and quacks like a duck, then it probably is a duck! So, if you see that Spyderco ParaMilitary 2 for only $50 brand new than you should instinctively know something’s up. All the legitimate stores have sales now and again but rarely will you find something ridiculously cheap and it be the real thing. Many of the vendors that will sell you a fake will not have any positive feedback or customer reviews. Typically the disreputable online sellers will list only a phone number or a P.O. box for contact information. You need to be careful with eBay too. While eBay can be a great place to buy products you still need to be on your guard for sellers with no reputation. We find most of the fake knives originate from Asian markets and particularly China so we do not recommend buying anything direct from China. Stick to reputable US vendors such as Amazon and BladeHQ. In many cases you will be able to clearly tell a knife is fake as the workmanship will be far worse than on the real thing. Also, many of the fake knives have features that are simply non-existent on the official versions. Take a look at picture below (courtesy of ColdSteel.com). The obvious thing to notice here is that the fake knife on the bottom has bead blast finished blade. 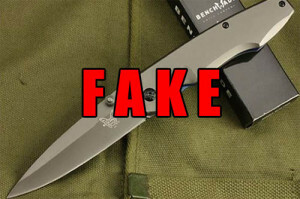 However, Recon 1’s have always been sold with a black blade so this is a clear sign of it being a fake. You’ll notice overall that the counterfeit version is a pretty close match to the authentic version and this shows how good the counterfeiters are getting these days. In holding the fake knife you would notice that the blade is wobbly and doesn’t open smoothly at all. As you’d expect the fakes are NOT covered by the official warranties. Check out more fake pictures from Cold Steel here. One knife in particular has been subject to mass counterfeiting lately which is the Chris Reeve Sebenza. If you know anything about knives you’ll likely be aware of the fact that this is a truly fine specimen and considered by many to be perhaps the ultimate pocket knife in the world. It comes with a hefty price tag as you’d imagine…close to $400 but it truly is a work of art. Unfortunately I’m seeing more fake Sebenza’s than ever these days and know quite a few people that have received one as a result of trying to save $50 or so. I found a nice video below which shows you the differences between an authentic Spyderco Dragonfly and a cheap Chinese knock-off. Hopefully you found this article helpful and it serves as a reminder to watch out for the cheap fakes out there. A high end pocket knife is really something special that should serve you well over a lifetime. Follow my simple rules and use your common sense and you should never have to worry about fake knives.